The only medical device platform in the marketplace today that fully integrates hardware, software, and electrophysiological I/O into a comprehensively maintained product saving you cost, time, and risk. By delivering 5 degrees of integration, your product development time enjoys a huge head start. By integrating the hardware, I/O, drivers, RTOS, and API into an electrophysiological subsystem, you are ready to begin application programming and testing right out of the box. By choosing the exact functionality and features needed in your embedded controller, you are not paying for hardware and software you do not need. Therefore, by design, we have the best product cost for what you need. 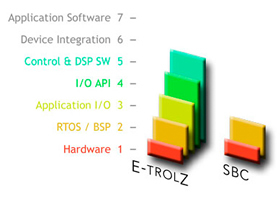 By integrating the hardware, I/O, drivers, RTOS, and API into an electrophysiological subsystem, OEMs can focus their efforts and resources on their core competency and dramatically reduce your development cycle. Instead of investing person-years on a micro-controller design, signal conditioning, drivers, and RTOS along with integration, you invest in your application program and device verification. We manage the fully integrated electronic subsystem for you. It's that simple. Supply chain issues - eliminated. Component obsolescence - done. Driver bug fix - done. By purchasing an E-trolZ product, you save on the resources dedicated to life-cycle management. Each controller encapsulates comprehensive embedded electrophysiological measurement and control expertise. Starting from the controller architecture, to the precision I/O hardware design, to the real-time interrupt routine, to the information management system, and finally the I/O and function APIs, you get years of real-time control expertise built-in, saving you immense design, integration, and verification effort. Each controller includes a electrophysiological class library of functions delivering advanced, proven application routines. The library of functions includes I/O conditioning, signal processing, scaling, alarming, and wave form analysis routines. With this library, you get years of high-level, real-time application expertise built-in, saving you immense software design, integration, and verification effort. By partitioning the two fundamental embedded tasks - 1) measurement and control and 2) information management, our Dual Partition Tri-Core Architecture dedicates a specific processor to execute completely independent threads with a designed priority to the measurement and control partition. Furthermore, our software is statically analyzable in advance of execution so that its real-time behavior can be guaranteed in advance. By design, our architecture delivers predictable, error free performance saving you tremendous development and agency approval time. By leveraging the structure that the I/O API and electrophysiological class library of functions deliver, your application program is inherently organized, simpler, and easier to support. In other words, it's optimized for size, speed, and supportability.